Are you planning to stay in Brno for a few weeks or even 12 months? Would you appreciate a place from which you can see the whole city? Choose a rental apartment in Brno-Židenice on Flatio and you will have one of such places close to home. Are you trying to decide in which part of Židenice you would like to live? Take a look at the Flatio map and choose rentals in Brno-Židenice according to where they are located. Do you enjoy new things, and are you usually the first to try them? On Flatio you can choose from the newest rental apartments to find the one which will suit your needs perfectly. You only need to take a close look at the virtual tours, check out the furnishings, and once an apartment catches your eye, send the landlord a reservation request for a few weeks or even months. Renting an apartment in Židenice will provide you not only with a spot overlooking the whole of Brno practically at your doorstep, but also with two forest parks right around the corner for weekend relaxation. Thanks to the Flatio team, you can find accomodation in a location which is just 5 kilometers from the city center, but in which you can also find forests and a spot overlooking the whole city. Living in such a convenient part of Brno, you won‘t miss any event, but you will avoid staying in the noisy city center. At the last census in 2011, this area of Brno, which is 5.05 km² large, housed a total of 22,000 inhabitants. Do you want to be one of them for 14 days or even a whole year? 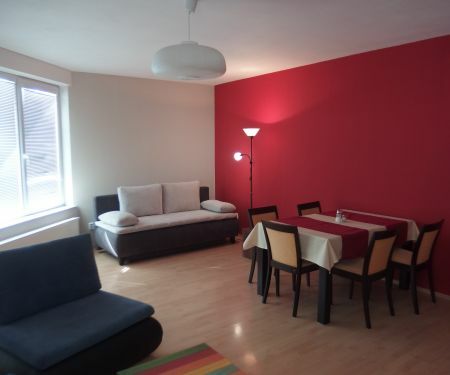 Rent an apartment in Brno-Židenice on Flatio and have your accommodation settled for the entirety of your stay. On Flatio, you can easily reserve the best apartment in Brno-Židenice for a few weeks or even months of your business, study, or vacation trip in the second largest city of the Czech Republic. In this picturesque part of the city, you can go for a weekend walk to two different forest parks or to a nearby lookout spot from which you will see the whole city, for example. Sounds like something you’d enjoy? Choose from the best rated rentals and request a reservation of the one which best suits your needs. Did your boss send you on a business trip to Brno for a month, or are you going on Erasmus to one of the universities in the second largest city in the Czech Republic? Purposes may vary, but every visitor will be looking for housing. 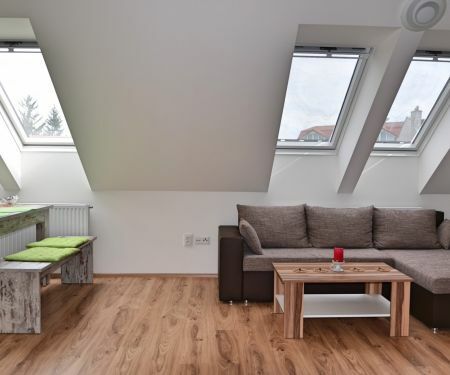 Find it simply on Flatio, which specialises in providing short-term, mid-term or long-term apartment rentals in Brno-Židenice. Are you traveling to Brno for two weeks and deciding whether to stay in a hotel or in a short-term rental? Choose from the offers on Flatio and stay in a home environment where your privacy is guaranteed. Are you going on a business trip to Brno-Židenice for 4 weeks? Or perhaps a month-long intensive study course awaits you there? Take a look at the Flatio website and arrange a month-long rental in this charming location in advance. Are you preparing for a half-year-long exchange program or business trip? Or is Brno simply another destination on your digital nomad journey? Reserve a rental apartment for 6 months in Brno-Žideniceon Flatio. Did it turn out that your visit to Brno will last for a whole 12 months? Hotel accomodation is unnecessarily expensive, it’s much better to rent an apartment for 1 year instead. You can find year-long rentals in Brno-Židenice simply on Flatio. Are you tired of the unnecessary fees that come with renting an apartment through a real estate agency? Don’t let yourself be held back by things which can be tackled easily and effectively with the help of the Flatio team. Check out the Flatio website, look through the accomodation on offer and easily choose a rental apartment in Brno-Židenice without a real estate agency, high commission fees or a deposit. We can do it all without those things. The Flatio startup is the ideal solution for all travelers looking for housing in Brno-Židenice for 14 days, 4 weeks, half a year or even 12 months and wishing to avoid having to deal with a real estate agency. Are you one of them? Check out the offers on the Flatio website, take a look at the virtual tours, and reserve the best apartment for yourself or your group of friends. You can easily find accomodation for a few weeks or months in Židenice without a deposit with the help of the Flatio team and its rentals. Stay in an area where you can look out at the whole of Brno and where lovely forest parks are right around the corner.